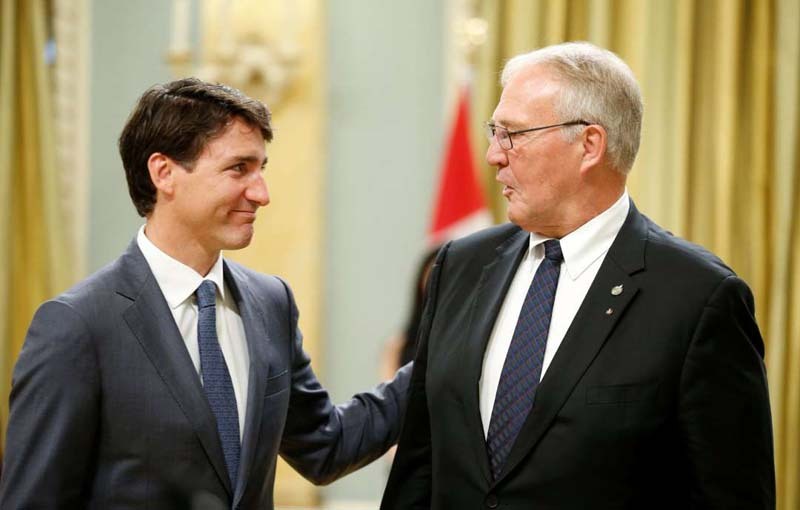 Prime Minister Justin Trudeau congratulating Bill Blair after he was sworn in as Minister of Border Security in July. Federal elections aren’t likely to be held until next year but a big issue is already shaping up — a possible ban on handguns and assault weapons. And Bill Blair, the minister of border security who is a former chief of police of Toronto, is about to begin a series of public discussions on the subject. The shooting rampage on Toronto’s Danforth Avenue in July in which a handgun was used to kill two people and wound 13 others led the City Council there to call on the federal government to ban sales of handguns and their ammunition within the city. Last month, the Montreal City Council went further and called for a national ban on the weapons. This week, while speaking at a House of Commons committee meeting, Mr. Blair gave himself until the end of the year to hold meetings with the public, law enforcement agencies, Indigenous groups and other levels of government. If an event last weekend in Toronto is any indication, those meetings may be lively. Mr. Blair was repeatedly booed by an often unruly crowd, particularly when he tried to argue that legally purchased handguns that were stolen or otherwise made their way into the black market are playing a growing role in crimes. A previous Liberal government’s introduction of a registry for shotguns and rifles, or long guns, revealed that while Canada may not have the same sort of gun culture as the United States, gun control is no less politically volatile here. The registry was repealed by a Conservative government. Although Mr. Blair has been instructed only “to lead an examination” of a full ban on handguns and assault weapons, the Conservative opposition is already acting as if the government had announced such a plan. At a recent hearing of the standing parliamentary committee on public safety, Glen Motz, a Conservative member of Parliament from Medicine Hat, Alberta, called the idea of a ban “a charade” and that was just for starters. There does not seem to be good national data on where Canadian criminals get their handguns. Some groups suggest they are mostly smuggled from the United States; other reports support Mr. Blair’s suggestion that many have migrated out of the legal system. Sorting out that evidence is now his task. Canadian law treats handguns and assault rifles differently than hunting rifles and shotguns, which are often part of daily life on farms and for people in Indigenous communities. The only place where Canadians who are not in law enforcement or on military duty can legally fire a handgun is at a registered firing range. It’s a crime to bring one on a hunting trip, let alone to walk around a city while carrying a handgun. The only place handgun owners can travel with their weapons is to and from a firing range. But they must have a special travel permit, in addition to their firearms license. And the weapon must be unloaded and have a lock inserted into its trigger. While many handgun owners are passionate about shooting and their weapons, they are comparatively few in number. As of last December 550,000 people and businesses had the class of permit that allows them to own a handgun or an assault rifle. Do you find yourself baffled by the upcoming midterm elections in the United States? Well, we have a newsletter just for you. Sarah Lyall, a Times correspondent who wrote with both wit and insight for many years about Britain, is about to introduce Abroad in America, a look at American politics specifically for non-Americans. It’s free and you can sign up here. A gratifyingly large number of you took some time last week to tell us what you think of this newsletter and to offer suggestions on how we can make it better. But we still want to hear from anyone who hasn’t answered the questions we have. Our survey takes less than 10 minutes to complete and you can find it here. —Quebec votes on Monday. Dan Bilefsky, my colleague who is based in the province and who was born there, reports that something is missing from the political debate this time around. —The Senate is expected to take the final step to end the honorary Canadian citizenship of Daw Aung San Suu Kyi, Myanmar’s leader. —Jennifer Steinhauer, my colleague who usually writes from Washington, was in Ottawa to examine why dairy has become the great impediment in the Nafta talks. —The United States and Mexico are reviving the idea that they may cut Canada out of any new version of Nafta. —Patches the dachshund is no longer the Little Unicorn, thanks to Canadian and American vets and 3-D printing. —Alan Abel has received his second obituary in The New York Times.